DescriptionFoam mat to be used in playpen or on the floor. · 9 coloured foam tiles. · Stimulate senses with its 5 touches. To be used on a non-slippery floor only. Suitable from 1 month old. This mat comes for free when you rent a wooden playpen. DimensionsSize: 100 x 100 cm. 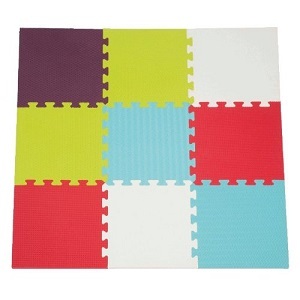 This foam playmat can be used in a playpen or simply on the floor, to enable baby to play on a soft, isolated surface. Its 9 tiles made of foam and different touches. In addition to a toys rental, it will allow your little one to enjoy playing when back from visiting Paris with your family. This mat is delivered (for free) with our wooden playpen available for rental. As for all our products, we do deliver this booster seat to your address, on appointment and will show you how to install it.